Did you get a new iPad for Christmas and want to learn how to take great pictures with its camera? Do you want to find out how to enhance or add special effects to those pictures and video clips you have already taken? One of the classes I will be teaching beginning January 8th at the Griffith Torrance Adult Center will teach you how to do these things, as well as many others. This short video further describes the class. Microsoft has a free program that allows you to create three dimensional views of your environment from a series of photos you upload. The style of view is controlled by how you take the photos and then control the synthesizing process. They call these views the spin, panorama, wall, and the walk. 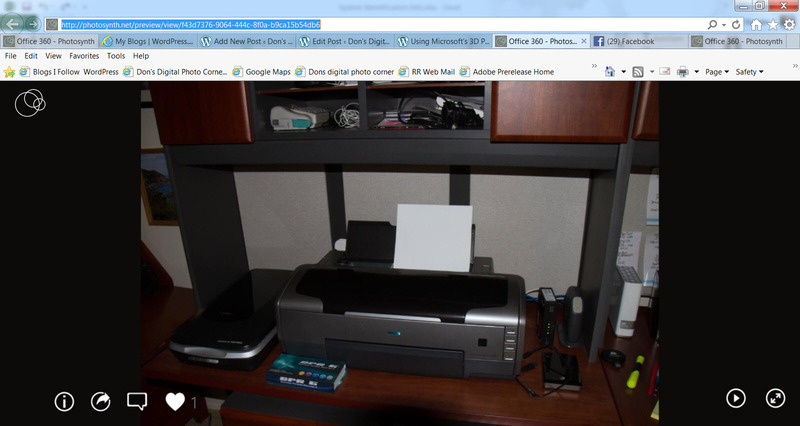 The link below will take you to my first attempt at using Photosynth. It’s a 360-degree panorama of my cluttered computer room. I used 21 images for this synth. To stop the spinning, click on the image, and then drag your mouse around at your leisure. I plan to try other techniques, for example, the walk. 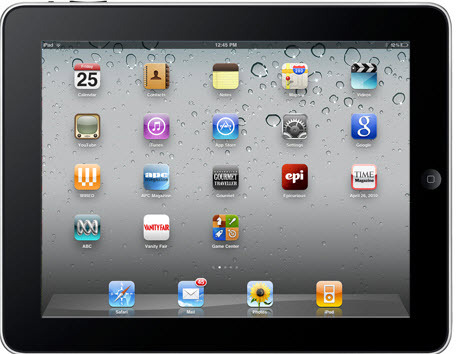 The site includes a detailed user guide. I’m also going to revisit the iPad app. TRy it out and let me know what you think by leaving a comment. In Windows 8.1, Microsoft added a free app called Movie Moments. It is available in the MS Store. The app is easy to use for the most part, although trimming something from the middle of the input clip is tricky – at least it was for me. The final video can only be one minute in length. That may seem really short, but it may work well for many subjects. The input video clip can be longer, but it must be reduced to one minute prior to saving it. For some time, I have been thinking about routinely posting short videos covering just a single tip or hint. Maybe this is one way to do that. Below is my first attempt. Admittedly, the tip is trivial, but I’m sure that better tips can be provided within the one minute limit. Let me know what you think via a comment or liking the post. Thanks. 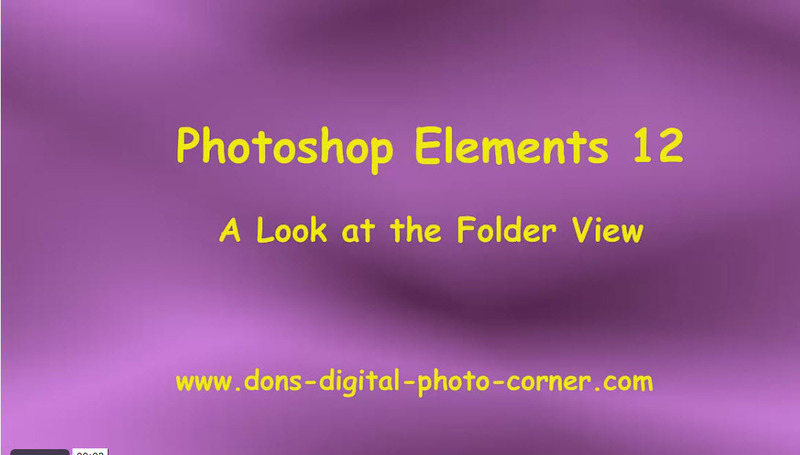 Photoshop Elements has had a Folder View for some time. But in earlier versions it was a bit clunky and had some bugs that were problematic. Consequently, I did not use it much. However, in PSE 11 the folder view was improved significantly. I think it can be a very useful tool for those of you who have organized your folders into well thought out folders and sub-folders. Even if your folder system does not have a lot of thought put into it, it can be quite helpful when you need to know the physical location or path to a particular group of photos. An example of such an occasion is when you are uploading a series of photos to somewhere like Costco to order prints. At some point in the process you need to navigate to the actual location of the pictures. I have made a short video that explains the how this view works. It is the top item on my Video Tutorials page of my website. Here is the link to that page. As you can see, the videos on this page have become dated and were made with earlier versions of Elements. However, they are still useful today. Sometimes it is primarily only the dark background that is the main difference. I have removed some, and will be adding new ones and even updating the older ones on the page soon. Please let me know if these videos are at all useful, and what other topics you would like see covered. My general advice to my students is to use only one Catalog. Do not be tempted to organize your photos into different Catalogs. 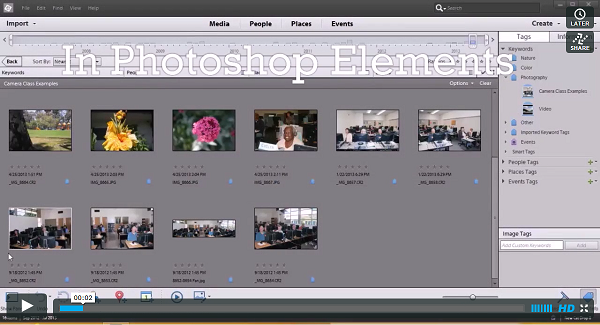 The Organizer of Photoshop Elements provides a number of ways to help you. The obvious one is to use Categories as a way to separate your media. For example, you could define one high level Category to business photos and another one for your personal photos. And then use Sub-Categories, and Keyword Tags to refine your organization structure beneath each of your two Categories. Another possibility is to use folders to keep your personal pictures separate from those devoted to your business. Given the significant improvements made to the Folder View in PSE 11/12, this approach has some real merit, especially if you are comfortable using folders and files to organize your other documents. Even Albums and Album Groups can be used. 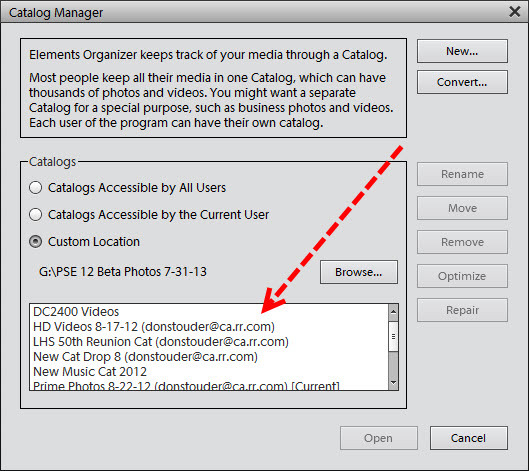 Any of these methods or a combination of them can be used to organize your media, so that you can find a given item quickly, without the added complications arising from using multiple catalogs. Well, I’m afraid I do not always practice what I preach, is illustrated in the figure below from clicking on File > Manage Catalogs in my installation of PSE 12. I rationalize my use of multiple Catalogs in a variety of ways. After all, I teach Photoshop classes and sometimes I need a Catalog devoted to that. At some point, I felt I needed a separate Catalog just for my video files, or one just for testing. I even have a Catalog that only contains MP3 files I have downloaded over the years – this one has proven quite useful, by the way. But by and in the large, I have more Catalogs than I need and this has made my life more complicated than need be. Granted, one large Catalog does require long back-up times when using the PSE Backup command. And there are certain dangers of putting all of those photos into the same basket. All that being said, I recently made yet another Catalog, and it has worked out quite well. Recently, my high school graduating class celebrated our 50th Reunion, and I volunteered to produce a DVD to commemorate the reunion weekend, as well as highlighting what life was like back in the early 60s for us. As part of this project, several of my fellow classmates submitted their pictures to be part of the DVD. Additionally there were photos from our high school years, as well as Super 8 movies. All and all, I had over five hundred files from which to choose for inclusion on our DVD. The project grew to include more than seven hundred items by the time the DVD was completed. I have been active on this project for a couple of months. During that time, I have also been taking a ton of personal pictures that I import into my prime photo Catalog. Using a new Catalog for the photos, videos, and music files for my reunion project made keeping everything straight much easier. I used the Backup command quite often throughout the project, since I was constantly changing the content and versions of the photos and video clips quite often. Backing up my prime photo Catalog (about 40K items) takes between three and four hours, while backing up my project catalog takes a matter of minutes. Now that the project is winding down, and the DVD is completed, another advantage of using a separate catalog is becoming apparent. 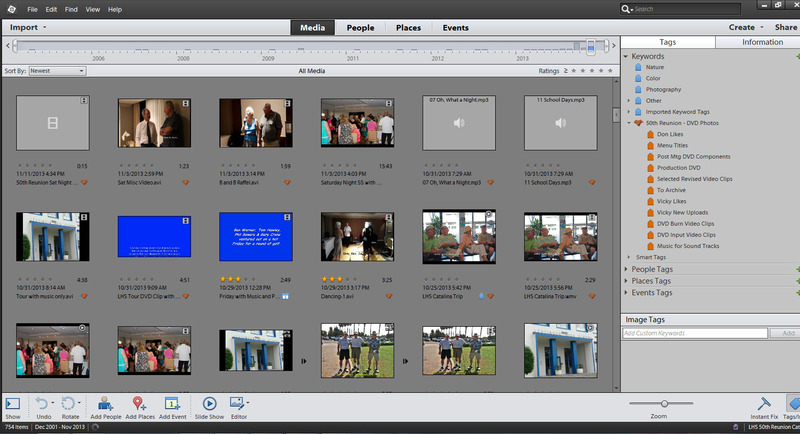 I have already begun to delete a lot of the content that I did not use to make the DVD. I will retain the photo CDs that were contributed by fellow classmates. Also, the pictures/videos that I took that became part of the project were Exported from my prime Catalog, so they are still part of that. As part of my final wrap-up of this project, I will Move all of the media in the reunion catalog to a DVD or Blu-Ray disk, using the File > Copy/Move to Removable Drive command. I will retain the Catalog, but the disk space it takes will be quite small. If I ever want to resurrect the project, it will be quite simple to get the media back. So, there is a time and place for using multiple Catalogs. Just don’t overdo it as one could argue I have. An Aside: As of right now, my initial backup to Carbonite is 56% complete with about 7,550 files to go. See my prior post on this subject.